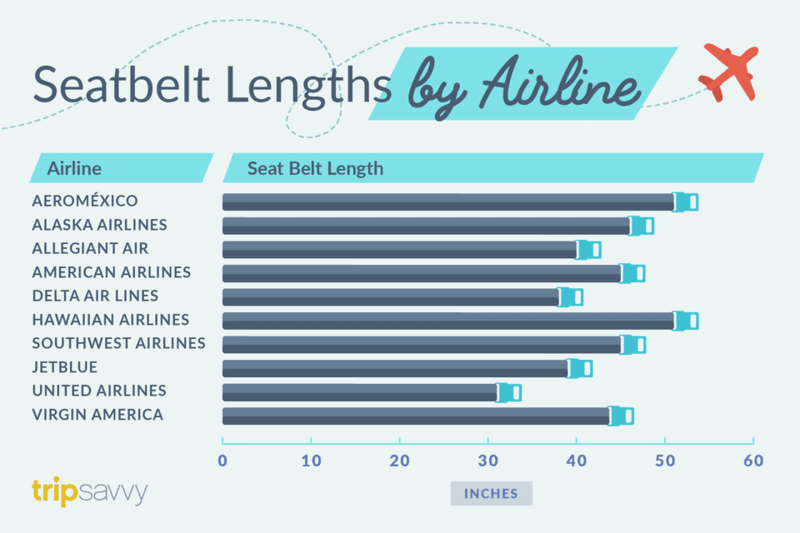 Seat belt length varies by airline and by type of aircraft. While you can find out seat widths online, many airlines do not provide information about seat belt lengths on their websites. You can get current seat belt information by contacting your airline. To avoid last-minute boarding problems, you should call, email or start an online chat with your airline whenever you have any questions or concerns about your tickets, itinerary, or flight. This process may take some time, particularly if you contact your airline by email or happen to talk with a customer service agent who does not know the answer to your question. Ask questions before you buy your tickets so that you have plenty of time to get the answers you need and make informed decisions about which tickets to buy. By law, airlines can establish policies for passengers that are overweight. These passengers, often called "passengers of size" or "passengers requiring extra space," can be required to purchase a ticket for a second seat if they meet certain criteria or cannot perform a specific action or combination of actions, such as lowering both armrests comfortably or lowering the armrests and fastening a seat belt with an extender. If you cannot comply with your airline's policy and cannot purchase a second seat because the flight is sold out, you may be denied boarding until the next day a flight with unsold seats is available. Airlines usually publish information about these policies in their Contract of Carriage. Your airline's Contract of Carriage, the legal document that spells out the airline's obligations to its customers, is available online or at the ticket counter. Several airlines have special policies that apply to the use of seat belt extenders. For example, Delta Air Lines does not permit passengers to use their own personal extenders, citing "FAA regulations" as the reason for this ban. Southwest Airlines also bars passengers from bringing their own seat belt extenders. Alaska Airlines does not allow passengers to use seat belt extenders if they are sitting in an exit row or in rows 1 through 6 on Flights 1 through 999. To help you find seat belt length information, we contacted several North American airlines to find out how long their seat belts are, on average, and whether those airlines provide seat belt extenders. Not all North American airlines are represented in this seat belt length table. While this information is current as of this writing, please bear in mind that airlines purchase new aircraft and upgrade their existing equipment on a regular basis, so your experience may differ from the data presented here. Contact your airline to get the best available information for your aircraft. All lengths are given in inches.